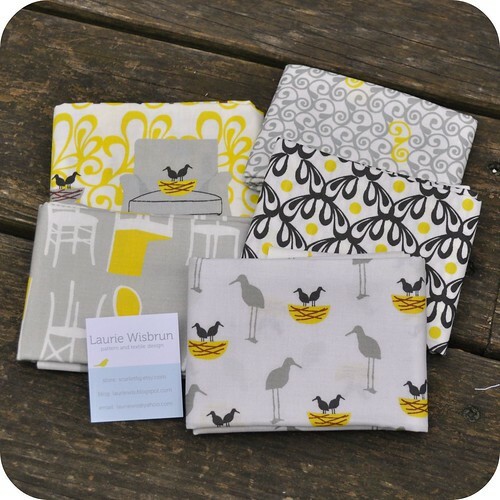 Thanks to everyone who entered the giveaway for Laurie Wisbrun's fantastic Nesting Chairs fabric. I wish I could send some to all of you, because you all described some wonderful project ideas for the fabric. But wait! Did you notice that the title of this post says WINNERS? Plural?? That's right! 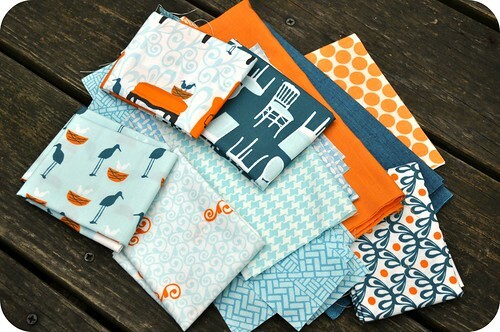 I've finished my project with the blue and orange bundle, and I've decided to send a scrap pack of my leftover fabrics to another lucky winner. What is it about fabric with furniture on it that gets us so excited? :) So glad you used the other colors....hmmm...I'm thinking I'd love a bag made out of some of it and of course pillows...I just ordered some fabric with those same colors! Congratulations to the winners! Please email me or leave a comment on this post so that we can connect on mailing information. Congratulations to the winners! How exciting that you can get to play with that darling Fabric! I bet they will make something beautiful with them. I can't wait to see what YOU made with the fabric. How exciting to see one of my pals win a giveaway, almost as exciting as winning myself! Such fab fabric! WhooooHoooooo....that was so fun to read this post and first go "awwww" because I didn't win and then go HOooooofreakingHOooooo because John was nice enough to part with his scraps! Oh congratulation to the winners. What an awesome win!